Well, it's Waiver Draft time... we'll make some key decisions for the segment of the season this week and everything will go live a week from today. But first, let's have a quick peek at the week that has just passed us by, too quickly, and then we'll saunter into the new week and start making our picks. Well, there you have it. Our first Vegas Golden Knights player making up the Player of the Week nod in the hockey pool. It only took eight weeks for it to happen! Jonathan Marchessault was a surprise to just about everyone, when he was left off of the Florida Panthers' protected list at the expansion draft and to many, he was a shoe-in to be taken by the Golden Knights, after such a breakout season in 2017. Well, he sure proved the Panthers wrong this past week, posting a 9-point week, the clear winner of the nod this week. Marchessault played in three games this week and in each game, he posted a goal and a pair of assists, doing so against divisional opponents like Anaheim, San Jose and Arizona in the week. The 26-year old has been very good for Vegas this season, now having posted 8 goals and 21 points in 19 games, which is now good enough for 59th overall in hockey pool scoring this season. For Benson, he has been running away with the forward points this season, now up to 163 points among his eight players up front. That has boosted his team up to 5th place in the overall standings, , now 6 points out of the money and 12 points out of 1st place. Speaking of 1st place, we have ourselves a new leader this season... and it's the reigning champ! Dale B. took full advantage of the big week in the schedule and posted a new weekly-high score with 41 points from his team, lifting his team up from 4th place and right into top spot. It looks like he wants to spend another summer with the trophy after a week like this. 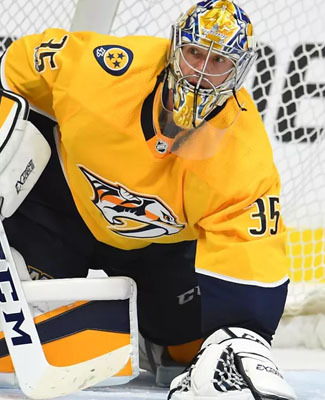 Nashville Predators goalie Pekka Rinne was his top performer in Week Eight, finishing with 8 points, and then his team also had good weeks from Canucks forward Brock Boeser, who had 5 points, while both Vegas forward James Neal and Islanders goalie Thomas Greiss each had 4 points as well. Only one of his players failed to register a point, but that was because he was stuck in the AHL, racking up the points down there, but those don't count, as much as you might think that they did. Dale's team got off to a bit of a mediocre start to the season, hovering around the middle of the pack, but in the last three weeks, he has seen his team shoot up the standings, going from 10th to 4th in Week Six and then the important jump form 4th to 1st in this past week. It is quite something, as Dale's team hasn't been dominating the skater games department, rather his team currently ranks 21st in skater games with 238, while the overall leader in the category has 284 games played. His goalies have played a lot, however, ranking 6th in the pool with 1,790 minutes played and 2nd in points from the crease. His defense is also quite good, also ranked 2nd in the pool in scoring, so he's getting the biggest contributions from the back end, currently. How sustainable is this push? With holding onto the top spot in the standings, he now will pick last in the 1st and 2nd round of the Waiver Draft and it will be interesting to see if he makes any moves. It wasn't a very good week for Stacey M.'s team, but if it was to happen, Week Eight isn't the worst time to have it happen. Dropping down in the standings will only help her team's Waiver Draft pick, which it did, moving from 10th to 16th in the standings, which means her pick went from 16th to 10th... weird how that happens! Stacey's team was only able to post 13 points in Week Eight and now her team sits 34 points out of the money, which isn't insurmountable, but it will make for a difficult push, something that the Waiver Draft may only marginally help. The bright spots on Stacey's team in Week Eight were Kevin Fiala of the Predators and David Pastrnak of the Bruins, who each finished with 3 points a piece, but that certainly wasn't enough to carry her team to any sort of glory in the week. And yes, she has a couple of easy moves to make on her team this week, so we'll see how her team improves right off the hop. Vadim Shipachyov and Artturi Lehkonen seem to be pretty good candidates for drops, if you ask me! Well, as it was pointed out in the Mover & Shaker, we have ourselves a new leader, as Dale B. unseated Jeremy for top spot and opened up a 4-point lead at the top as well. Oh, that lead isn't on Jeremy... no! It's like deja vu from last season, as Brian now sits number two, the 2nd place team from last season, while Jeremy dropped down to 3rd place, thanks to only 24 points in the week. Jeremy now sits 6 points back of top spot, but that isn't an impossible total to overcome. Only Kristy & Don and Benson's team are now within 10 points of the money, while Stuart's team made some moves in the week, bumping up to 6th place and now sits 11 points back of 3rd place. The Waiver Draft should tighten this race back up, starting next week, but first, we have to make it through the picking process. The bad week for Stacey M. continued through the goalie survivor pool, as her team was one of three to be eliminated in Week Eight. Stacey C. and Tony had the other two teams that failed to register a win and this was three teams that had some legitimate shots at winning this mini-game. Stacey C. had Brian Elliott and Semyon Varlamov, both big minute goalies, but Varlamov got sick this week and the Flyers fell flat. Stacey M. has Matt Murray and Cam Ward, when the Penguins couldn't get their number one goalie a win and Ward was limited in his starts in Carolina. Tony, probably the biggest surprise, has John Gibson and Craig Anderson, and shockingly, neither was able to pick up that crucial win to stay in. Now, we're down to five teams: Jeremy, Cam, Grant, Wilton and Mike. It wasn't all bad for Tony, as his team climbed back into the plus/minus race, claiming a season-high, +26 rating in Week Eight. He went from -13 to +13 in a matter of one week and now his team sits 10th in the standings and if his team can find a few more weeks like that, he could be in the conversation for the money at the end of the season. Steve moved back into 1st place in the mini-game, also posting a very good week with a +13 rating in Week Eight and now sits at +40 overall. Dale B. is only a couple points back, while Brian also made moves up close to the top, now 6 points back of Steve. Can Steve find some plus/minus magic in the Waiver Draft? Ahead of the Waiver Draft, we saw some slight increases in participation in Week Eight, which was great for the pool, but questions are now abound about who will get dropped... will it be worth it? With a season-high in games played on the NHL schedule, it should come as no surprise that we had records in total points with 646 on the board, but we were nowhere near records for an average pull from an NHL game, which was only at 12.4 points in 52 games. This coming week has 50 games in it and there are some healthy bodies again, so if scoring can manage to find its way back up, beating 646 points doesn't appear to be so difficult. On Sunday night, the Arizona Coyotes made the call and told Dylan Strome to pack his bags, he's joining the big club again. Strome has been lighting up the AHL of late and he gets the nod for a spot in Week Nine. Strome played in two games at the beginning of the season, to no avail, but really honed his game in down in the minors and the Coyotes now think he's ready to apply that confidence at the top level. We shall see if they're right. How to make decisions difficult for Dale B., who could start to run away with the pool again, if he can get a top end scoring prospect like Strome to go or else he could be stuck with another NHL dud for another nine weeks, if he stays, isn't dropped and flops. How intriguing! The San Jose Sharks have recalled Antoine Bibeau on an emergency recall on Monday, suggesting that Martin Jones may not be ready to play on Tuesday night in Philadelphia. Jones is now considered to be day-to-day with a lower-body injury, but there doesn't appear to be any panic with the Sharks at the moment, but the week is young! Chris' team is in need of some good news, as it really has fallen off the pace over the last four weeks and his All-Star goaltending tandem has already let him down in the goalie survivor pool. His team bounced back up to 10th from 11th in the week, but going down a goalie for an undetermined amount of time certainly won't help. The upper-body injury that Winnipeg Jets goalie Steve Mason suffered on Saturday night is indeed a concussion and he was placed on the Injured Reserve on Monday morning, which means he'll be out until at least the weekend with the ailment. Mason has 2 wins in eight appearances this season, not quite fit to be a number one in his new landing spot and this injury is just another insult tacked on to his year. It will definitely be tough for him to take back the net from Connor Hellebuyck, who has been good in his place. Troy definitely has some decisions to make this week, as his team currently sits in 21st place in the standings and will pick 5th in the Waiver Draft, starting today (in all hopes!). His team is 47 points out of the money and he could really use an active goalie, to help his cause along.